Click on the Start, then on Control Panel. From the Control Panel click on Mouse. The Mouse Properties will open. 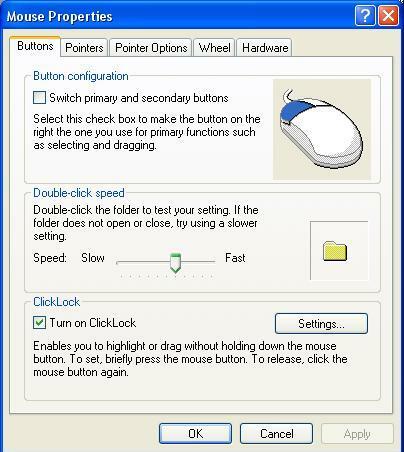 In the Buttons section youâ€™ll see Button configuration, Double click speed and ClickLock. Check the square in front of the Turn on ClickLock in order to turn it on. Next to it are the Settings for the ClickLock, which give you the opportunity to choose the delay time for the ClickLock to be activated.